News, events, and happenings in agriculture. I have received many pond calls regarding weed control. One particular weed worth mentioning is Bacopa caroliniana, commonly known as lemon bacopa, blue hyssop or water hyssop. 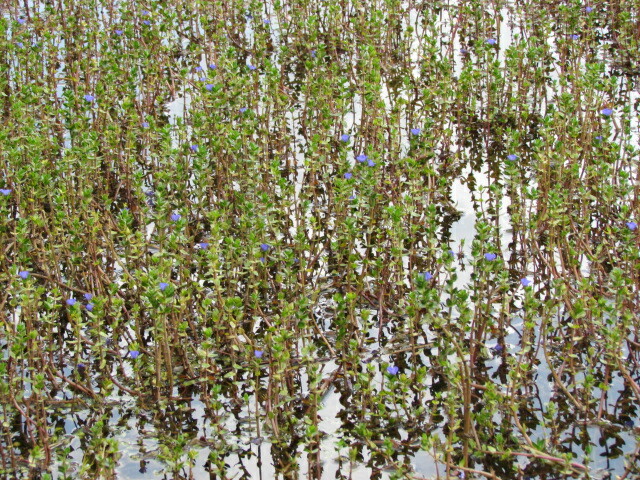 Early references classified this plant in the genus Hydrotrida. This species, lemon bacopa, is distinguished by its blue flowers, a hairy upper stem, and by the lemony scent of its crushed leaves. 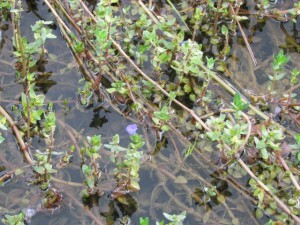 A native aquatic plant common to lime sink ponds and the coastal plain of Georgia. . It is found in southern U.S. and Maryland. It has become invasive in ponds where grass carp have been used to control submersed weeds such as Hydrilla. Grass carp will not control lemon bacopa. 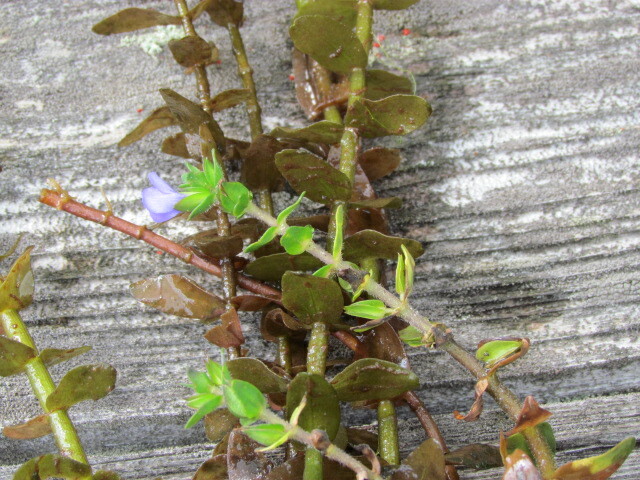 Lemon bacopa is very hard to control because most treatments use either a contact herbicide that requires repeat applications or an expensive systemic herbicide like fluridone at a high rate and expense. Either way, this weed is costly to control. This plant is difficult to control and 2,4-D has only browned it. So, control can be achieved with diquat or combination treatments that involve diquat and endothal, both are contact herbicides and repeat applications are needed. 1) Fluridone (Sonar or Whitecap) may be considered for control in order to reduce labor in ponds with limited flow-through. Granular applications of fluridone will last a couple months and kill the root and could possibly provide season-long control. 2) Apply diquat (Reward or generic Diquat) at 2 gallons per surface acre, use nozzles that release under the water surface. Or, apply endothal as Hydrotol AR or 191 granules at the rate of 40 lb per acre (in water up to 4 feet deep). Note: Hydrothol AR label indicates at 0.2 ppm concentration at 4 feet with 44 pounds of the granular formulation. That is safe for fish. Above 0.3 ppm can kill some fish species, so avoid over application. 3) One other possibility that involves a systemic herbicide is to apply imazapyr (Habitat or Ecomazapyr 2 SL) at 2 pints per surface acre with a surfactant or sticker/spreader adjuvant. Use a 0.5% solution and completely cover all emergent and actively growing vegetation. This herbicide takes about three weeks to start the kill. You should limit the time of year that imazapyr is used, however. Imazapyr should be applied in warmer weather when plants are actively growing. Herbicide choice would depend on other weed species present and size of the area to be treated. Call me for recommendations that fit your specific situation. Posted in Ponds. Bookmark the permalink. Previous: Ensure Proper Planting Depth of your Forages! !